eggs and grass in it. 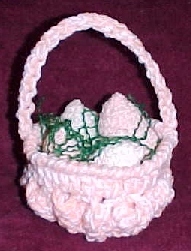 I have not tested this pattern so if you find an error please contact me. Stitches used: ch, sl st, sc, dc, love knot. LOVE KNOT: Ch 1 loosely, sc in the hump on the back of the ch. NOTE: Entire pattern is worked holding two strands of yarn. (I used one strand of white and one strand of light coral.) 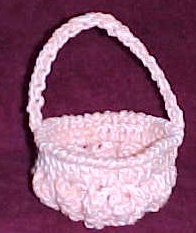 This basket measures 5 3/4" diameter and 7 1/2" tall, including handle. RND 1: Ch 4 (counts as 1st dc), 11 dc in 4th ch from hk. Join with sl st in top of beg ch 4. RND 2: Ch 3, Do not turn (entire pattern is worked on right side), 2dc in each of next 11 dc, dc in last dc. Join with sl st in top of beg ch 3. RND 3: Sl st between posts of next 2 dc. Ch 3, (dc, ch 2, 2 dc) in same sp. Sc between next 2 dc. * (2dc, ch 2, 2dc) between next 2 dc. Sc between next 2dc. Repeat from * around. Join with sl st in top of beg ch 3. RND 4: Sl st in next dc and in next ch 2 sp. Ch 3, (dc, ch 2, 2 dc) in same sp. Sk next 2 dc, (2dc, ch2, 2dc) in next sc. * (2dc, ch 2, 2dc) in next ch 2 sp. Sk next 2 dc, (2dc, ch 2, 2dc) in next dc. Repeat from * around. Join with sl st in top of beg ch 3. RND 5: Sl st in next dc. * Sc Dec over next 2 ch 2 sps. Ch 2. Repeat from * around. Join with sl st in 1st Sc Dec made. RND 6: Ch 3, dc in same sp as beg ch 3, 2 dc in next ch 2 sp. * 2 dc in next Sc Dec, 2 dc in next ch 2 sp. Repeat from * around. Join with sl st in top of beg ch 3. RND 7: Ch 1, Rev Sc around. (Remember that you work the stitches to the right instead of the left). HANDLE: After last Rev Sc, Ch 1 and begin working love knots until the handle is the length you prefer. Fasten off, then attach it to the opposite side of the basket. If the handle isn't stiff enough (depends on how tight you crochet) you can run a piece of floral wire through it to make it more steady. GRASS: Cut a bunch of strands of green 4 ply yarn about 4 or 5 inches long. Separate the strands into 4 pieces. This makes great Easter grass.